Last week a new campaign was launched to demand government by sortition. Its aim is to promote sortition and build a movement demanding the replacement of elections with sortition. What right have a tiny group of activists got to “demand” sortition? This is the sort of language used by groups like ISIS, rather than one with a supposedly democratic agenda. By all means let’s seek to persuade, but demanding this or that will only damage our cause. Ditto with the (ab)use of the Occupy slogan — the parallel between Wall Street and Westminster is entirely specious. What would we commoners ever do without you, and other serious and wise people like your humble self, telling us what language to use, Sutherland? You’d be up s**t creek without a paddle! I don’t mind anybody shooting themselves in the foot, the problem with Citizen Smith projects like this being that they drag the whole concept of sortition through the dirt. When a movement has a good solid core it can afford a lunatic (and even a Celtic) fringe; not so when most people don’t even know what sortition is. The claim that everyone who makes “demands” on a government is a terrorist is obviously absurd – many Greenpeace campaigns demand a stop to various forms of pollution. And the idea we should stick to persuasion is very naive – since when was politics and change governed by reason and persuasion? If it was we would have fixed climate change decades ago. If you wish to keep sortition confined to the realms of academia by all means stick to persuasion, campaigns for political change must appeal to emotions first of all to inspire action, and reason second. And, by the way, Occupy was a global movement (yes, I was involved, but not on Wall Street, NY) and a strong critique of our electoral democracy was a vibrant strand of it. Greenpeace (as you well know) has 2,800,000 paid-up members worldwide, and so is in a better position to make demands. How many supporters of sortition worldwide are there? I once approached the organiser of a political theory conference and asked him if we could put together a panel on sortition and his response was “sure, but what is it?”. So, rather than making demands, we should seek to educate and persuade. In this respect misleading quotes lifted out of context from Aristotle, Montesquieu, Rousseau, Adams etc really don’t cut the mustard. What we need is arguments and evidence, not hectoring. As for your slogan to “Kick All the Politicians Out Now”, most sortition researchers currently argue that sortition should (at least initially) be used alongside election, so there is no point in wilfully antagonising existing stakeholders. >campaigns for political change must appeal to emotions first of all to inspire action, and reason second. So your policy is to act first and think later? At least Lenin and Mao had a solid body of theory on which to base their revolutions. No such body of knowledge exists in the sortition domain. 1. It may be better to have series of small scale meetings before have a large conference. This will allow to prepare some groundwork. 2. Physical travel is often prohibitive. How about holding some meetings through video links? I agree with Yoram that we should be promoting, rather than demanding, sortition. As a democrat, my deference is to the well-informed views of the public (hence my argument that Greenpeace’s 2,800,000 members better qualifies it to make demands). As usual, Sutherland is able to misunderstand the simplest and clearest English. I am all in favor of “demanding” sortition. And – no – the number of members of an organization doesn’t make its demands more legitimate. At best it makes them more popular. 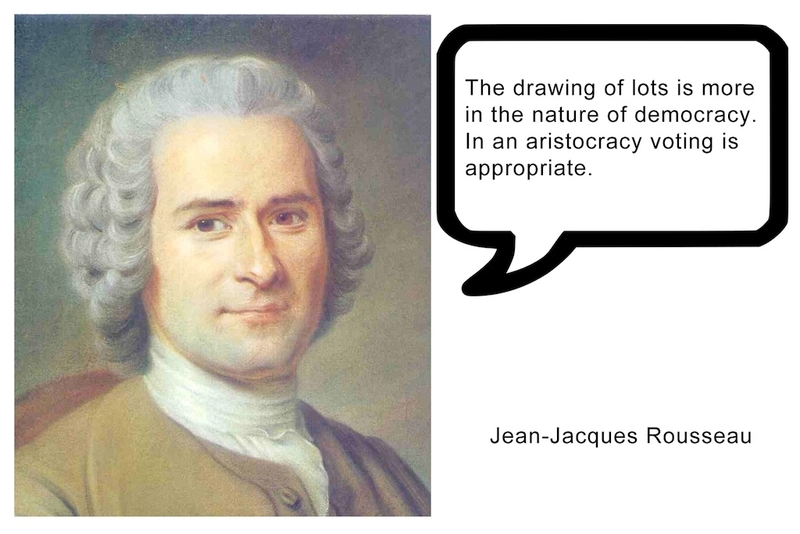 That’s an interesting (and controversial) gloss on the meaning of democracy. No doubt the members of the tiny cabal demanding “real democracy” are the heroic and enlightened leaders of the revolutionary vanguard, seeking to remove the shackles of false consciousness from the ignorant proles. God forbid that we should ever favour “popular” policies. Note that what bretthenig is demanding is not a deliberative constitutional convention from which suggestions would emerge from the collective representative wisdom of the allotted participants, he’s demanding the replacement of politicians with sortition — an aleatocratic coup. And what will he do if his demands are not met? Again, your inability to understand simple English on full display. Democracy indeed favors more popular policies. That says nothing about their legitimacy. What then is your criterion of democratic legitimacy? I acknowledge that it would be better epistemically if the policies were the result of a balanced deliberative exchange, but in the end democracy entails majoritarianism. “Popular” in this sense means that they are the policies that the majority would choose were they able to participate directly in the deliberative exchange, and in this sense we need to distinguish between “popular” and “populist”. Democracy is legitimate government (this is not self evident, of course). Obviously, this doesn’t mean that any policy decided upon democratically is legitimate. Is that a normative evaluation or a definition? If the former, then advocates of other political systems would obviously disagree. If the latter then it’s an empty tautology that merely replaces one linguistic token with another, rather than telling us anything about the state of the world. Needless to say your definition is a long way removed from the regular dictionary definition — a system of government in which the people have power. >this doesn’t mean that any policy decided upon democratically is legitimate. The plot thickens, as the “obviousness” of your claim depends on the meaning of your first sentence. I find all this so puzzling that I wonder whether we actually share a common language. > normative evaluation or a definition? > If the former, then advocates of other political systems would obviously disagree. OK glad we’ve cleared that up, so now we know that “democracy” is a system that Yoram Gat approves of — this tells us nothing about the state of the world, only the political preferences of an Israeli software engineer. Presumably this means that if a decision is made democratically, but Yoram doesn’t approve of it then it’s illegitimate. For a close matching claim on the solipsistic stakes we need look no further than Louis XIV’s “l’etat c’est moi”. You did notice that I answered “the former” – i.e., evaluation, not definition? Exactly. You haven’t told us what democracy is, only what you like. So a democratically legitimate decision is one that you like. Personally I’m not that interested in what you or I like, my work is an attempt to specify the guiding principles for a system of government that ensures the rule of the well-considered preferences of the demos. “Told us”? Who is “us”? Who do you presume yourself speaking on behalf of? Your pomposity is impressive. Democracy is a situation of political equality, or, equivalently, of equal representation of interests in public policy (as I have written many times here before). I have also suggested to operationalize this definition by having an allotted body evaluate this criterion. By “us” I was referring to anybody on this forum who is still listening (chances are that’s no-one at all). Thank you for finally coming up with a substantive definition of democracy. Interests is a problematic concept as many people have staked a claim to represent the interests of others. That’s why the regular currency of democracy is preferences, not interests. If by “finally coming up” you mean “repeating a definition that you have furnished many times before but that in my usual obtuseness I have not bothered to notice and instead claimed you never mentioned it” then you’re welcome. I was referring to this particular exchange. Indeed, since “exchanges” are no more than a medium for repeating our own pre-fixed ideas, it is inconceivable that we actually learn something from previous exchanges. > What right have a tiny group of activists got to “demand” sortition? Keith is touching upon a central issue here, but the prevailing confrontational mood in the comments (of which he is not completely innocent) steered the debate away. For all it is worth, we may indeed demand sortition at the top of our lungs — if this is supposed to bring a general change (and by general I mean affecting the whole electorate and not only we sortitioners), it will achieve nothing until we manage to convince at least half of that electorate to validate the new system in a referendum. And and as much as I love Chouard, whose last video just abounds on Keith’s “persuasive” approach, I’d rather try something more practical while we wait for le Grand Soir. The only “right” on which we can make any demands is our individual right to political participation. As Keith put it, he and the world at large do not need to care about the views of a software engineer, but the software engineer surely does. He can hence demand to exercise his individual right to political participation by sortition instead of election, as long as he does not impinge on anyone else’s right to choose election before sortition. What is different with this approach is that it can be supported even by those who personally oppose sortition but at the same time acknowledge the right of every individual to exercise his right to political representation as he or she sees fit. In a society like ours, where freedom of choice is paramount, such a demand could be widely supported. >He can hence demand to exercise his individual right to political participation by sortition instead of election. Sure, in a free society, people can put a placard on their back and walk up and down the street demanding all sorts of things. But they are generally regarded as fruit cakes and don’t tend to recruit many to their cause. Pragmatists generally opt to persuade rather than demand. Since you keep paying attention to what is only accessory and leaving aside what is essential, let me phrase my proposal differently. As a pragmatist, do you find it easier to persuade the whole electorate or at least half of them that sortition is good for all of them and as such should be imposed, even slightly, on all of them, or instead to persuade them that sortition is a legitimate choice that everybody should be allowed to make if they so wish? In other words: should they be asked to renounce to exercise as usual (by voting) a portion, albeit slight, of their personal quota of “sovereign authority” (The Social Contract, III, I) in exchange of an equivalent chance of being sorted, or should they just acknowledge the right of other people to use their own personal quotas as they fancy? Sorry, I misunderstood your proposal. Martin Wilding Davis’s Newid party (who contested the election for the Welsh Assembly a few years ago) came up with the policy that one option on the ballot paper would be to cast your vote for a representative selected by lot. In a PR-based system this would then lead to a number of members appointed by preference election and a number elected by lot. There was a Greek political theorist who came up with a similar proposal; ditto our Italian friends (all who have contributed to this blog). I’m sceptical as to how the dynamics of this would work out in practice, but I’m cautiously in favour of proposals like this (in fact I was one of the few people who actually joined Martin’s Newid party). What I dislike about bretthennig’s proposal (unless I’ve been misled by its hyperbolic sloganising) is the “demand” to replace election by sortition. And the reason that my support is only cautious is because I don’t think it adequately separates the different role of election and sortition (it assumes that members selected by the two different mechanisms perform identical functions), but it’s (arguably) better than nothing. However it would give sortition a bad name if it didn’t improve the quality of governance. For example a group of randomly-selected persons could well hold the balance of power, so such persons would be heavily targeted by lobbyists, so the risks are legion. That’s why I believe we need to clarify the conceptual issues — to establish what sortition can and cannot legitimately do in principle — before just putting it as an option on the ballot paper. Arturo, see here for a similar proposal. Thanks to both of you. I was certainly familiar with the work of Filimon Peonidis; Tomás Mancebo pointed it to me sometime ago. But my proposal differs from his in a crucial point that has to do with how exigible it is. That is why I highjacked Brett’s post (and I apologize for that). What makes “demanding to replace election by sortition” so farfetched? It is the fact that most people, as things stand now, seem to prefer election, or at least to be comfortable with it. Who made us kings to deprive them of their right to vote for their representatives? It is only when you bring the problem to the level of the individual right to political participation that any demands begin making sense. Rousseau again: et d’où cent qui veulent un maître ont-ils le droit de voter pour dix qui n’en veulent point?. If I choose the option on the ballot paper to cast my vote for a representative selected by lot, I am in fact renouncing to my right to political participation: I have neither a representative whose political views match my own nor an equivalent chance to be alloted myself. That is very generous on me, but does very little to build my case. In such a system, the rational thing to do if you want to maximise your leverage is to volunteer for the pool of potential allottees, then vote (secretly, as all votes are) for the political party of your choice. Contradictory? Sure it is, but not naive. With a proposal like Peonidis’, you may try to persuade others of the inherent beauty of sortition but you have a very weak case if you want to demand it. The powers that be could always tell you that you can simply vote for a list that has been sorted ex-ante (“Morena” in Mexico) or, even better, whose members have a formal compromise to renounce in favour of the winners of a lottery held ex-post (the now defunct “Sorteo Político” in La Coruña, Northwestern Spain). They would be right in saying that the final outcome, for all practical purposes, would be very similar. Only when things are brought at the level of the individual right to political participation is when I can have a say on how I exercise this right. I do not care how you exercise yours (or, to be more precise, it is not my business), but I will not let you decide how I exercise mine. If you want to give yourself a master by voting, I am fine with it. If I do not want to give myself a master and prefer to try my chance at the lottery, you should not object to it. I’ve re-read your comment several times and I’m still struggling to understand. I guess your perspective is more existential — the individual right of each citizen to exercise her free choice — whereas most of us are concerned with designing an equitable and well-functioning political system, opting for your “formal compromise to renounce [their personal preference] in favour of the winners of a lottery held ex-post”. The justification of the latter is purely democratic (in the statistical sense), I guess few of us really share your overriding concerns for the right of each individual to exercise her personal choice. This right is poorly implemented in the electoralist case, but sortition would, if anything, make the problem dramatically worse (hence my frequent reference to the “disenfranchised masses”). That’s of no particular concern to democrats, although existentialists might find it a little distasteful. Or have I misunderstood you? I guess your focus on “prefer to try my chance at the lottery” indicates that your concerns are very different from those of us who are merely trying to establish a lottery-based system, with the fervent hope that they won’t be personally called to serve on the resulting political jury. Our model is more the (randomised) military draft than the National Lottery. I can’t quite tell if you understand Arturo’s proposal or not…Let me try summarizing it as a native English speaker ( I think I get it). Rather than trying to institute a whole new system of sortition that replaces elections, each voter is allowed to choose one of two paths to representation. The voter can vote for a party nominated candidate as usual, or the voter can “vote” to be represented by those who get randomly selected. The number of elected and allotted members of the legislative chamber would be determined by how many people took each option. If everybody voted for candidates there would be no allotted members, if 50% of voters voted to be elected by lottery, then 50% of the chamber wold be made up of randomly selected members. I believe there would also be a rule that only those who voted to be selected by lot would be in the lottery, since those who chose to vote for a specific candidate wouldn’t be allowed two bites at the apple. The notion is that in this way nobody is ever “disenfranchised” and society could organically evolve to a predominantly sortition system if the people preferred it that way — and the only demand is the right to personally reject all nominated candidates and to be represented by random selection instead. There are plenty of details to be decided on (e.g. would people who don’t vote at all be included in the calculation of the ratio of elected vs. allotted members, or would they be discounted as under current electoral schemes)? >I believe there would also be a rule that only those who voted to be selected by lot would be in the lottery. So one could (in effect) be voting for oneself. Most aleatory systems make a point of excluding anyone who wants the job from the lottery pool. This adds dramatically to my sense of unease with the project (my original concerns being the lack of adequate functional distinction between the roles of elected and allotted MPs). As Groucho Marx put it: “I don’t care to belong to any club that will have me as a member”. It would generate a system of government by unaccountable axe-grinders; my concern has always been the enfranchisement of the silent majority (who wouldn’t dream of nominating themselves for anything). Spot on, Terry! I am very grateful for this clear rendition in English of my convoluted explanations. I’ll try anyway to reply to Keith, but there is a considerable risk that I will only make things worse. If this is the case, please everybody keep in mind that Terry has perfectly described here what I have been suggesting. With regard to those who abstain, my initial proposal is that they are not counted. When I adapt the example already included in article 163.1 of the Spanish Electoral Law, the following figures result: 480K votes to party lists and 180K options for sortition, giving three seats to be sorted and eight to be distributed among parties. I also considered the possibility of automatically including in the lottery all the abstentionists (not in the Irish sense of the word, mind you!). In this case, there will be no deliberate act to opt-in for the lottery. But I finally discarded this choice because it could give a bad name to sortitioners. It took me so long to finish my post (my wife made dinner in the meanwhile) that I missed the last message from Keith. I would be more than willing to fall back to that former option of giving a chance at the lottery to all those who abstain. No opt-in at all. I find Keith’s arguments rather convincing, but I would be most thankful to whomever could argue in a different direction so that we can make a truly informed decision :-). Am I un existentialiste qui s’ignore? But seriously, be assured that I am solely concerned with designing and helping bring about a political system that is equitable, well functioning and above all feasible in the near future. My insistance on “individual rights” is only a means to a higher end and not (at least for me) an end in itself. > I guess your focus on “prefer to try my chance at the lottery” indicates that your concerns are very different from those of us who are merely trying to establish a lottery-based system, with the fervent hope that they won’t be personally called to serve on the resulting political jury. The Ancient Greeks had a word for those who refrained from political service. But seriously, I only have a problem (and I think it was the same for Plato) with those who actively seek power. And this obviously means carrying the card of a political party. In my initial proposal, which as I said is open to change in this particular point, the act of choosing the lottery instead of voting can only secondarily be considered as an opt-in — it is first and foremost an act to detract from the elected/allotted ratio. As an aside — the best solution I could come up with, beyond the classical and not fully satisfactory one of making every vote secret for allotted MPs, was to be found in criminal law, under the form of an extreme “risk asymmetry”: alloted MPs who accepted bribes not only will be innocented if they denounce their corruptors before they are discovered, they even get to keep their ill-gotten gains! The goal is that nobody dares to bribe an allotted MP because the rational attitude of the latter will always be to denounce the plot, sooner or later. > So one could (in effect) be voting for oneself. I am not sure whether I get this one. > If everybody voted for candidates there would be no allotted members, if 50% of voters voted to be elected by lottery, then 50% of the chamber wold be made up of randomly selected members. It follows logically that, if all voters voted to be elected by lottery, then the whole chamber would be made up of randomly selected members. If this were to be the case, would you still be saying that everyone was voting for oneself? I accept that the odds are similar to playing the National Lottery under those conditions. But the odds would be very different if the allotment pool excluded those who failed to vote at all (it would be possible, in principle, for one person to vote for a political party, one for allotment and everybody else to abstain). Although that’s highly unlikely to happen my concern is, as always, to privilege the judgment of the silent majority over that of political anoraks and other busybodies (like those who are “demanding” the replacement of election by sortition). This is particularly worrying now that we know that these people have also chosen to endorse political parties that share their own partisan agenda. Which leads to my inevitable, unfortunate conclusion: Sutherland is a troll & has no place in PRO sortition discourse. Before we hear wails of freedom of expression … Sutherland-like trolls and assorted sock puppets are free to express themselves elsewhere. You don’t join a golf club to complain about golf. Similarly, these forums are places to discuss the *advancement* of sortition. If you’re not interested in actual implementation of sortition, please carry out that discussion elsewhere. However, it’s my suspicion that the purpose Sutherland et al is to disrupt & obfusticate the conversation in pro sortition forums. > the voter can “vote” to be represented by those who get randomly selected. Why not just have a sortition political party instead? i.e. Vote for the sortition party & all parliamentary decisions (for your electoral candidate) will be made by a random selection of citizens from your constituency. While personally I find Sutherland’s comments to be always useless and often offensive, it seems to me they do not crowd out or discourage other comments. I am not against regulating speech as a matter of principle and if I thought Sutherland’s comments stifle discussion I would support limiting him to his fair share of the volume of comments (rather than banning him altogether, which seems undemocratic). I’d be inclined to support this if there was a regular lively fruitful discussion on the blog which was frequently derailed or disrupted by Sutherland’s comments. Unfortunately I don’t believe this is the case. Much to my frustration, it often seems that if it weren’t for Sutherland’s comments there would be no discussion at all. Whether that would be a better situation is doubtful. I don’t want to go all po-mo, death of the author etc, but I also wonder sometimes if “Sutherland” really exists? Remember that he has already volunteered his own name for the ostraka, and would happily accept banishment if a simple majority of the 336 subscribers to this blog voted to ostracise him. No doubt Anonymous would argue that he’s in danger of corrupting the youth on this blog and would prefer the Socratic solution. >If you’re not interested in actual implementation of sortition, please carry out that discussion elsewhere. I have written and published two books proposing (rather than demanding) the “actual implemention of sortition” (The Party’s Over and A People’s Parliament) and this is the topic of my ongoing PhD research. In fact it’s been the primary focus of the last 15 years of my life, so this would be strange behaviour for an anti-sortition troll. P.S. Trolls generally hide behind a wall of anonymity, so perhaps our friend would like to come clean as to her physical identity? >Much to my frustration, it often seems that if it weren’t for Sutherland’s comments there would be no discussion at all. Whether that would be a better situation is doubtful. Thank you, it’s always better to be damned with faint praise than to be ignored.